JBL Control NOW Speakers Are Corner Friendly | OhGizmo! By Andrew Liszewski on 08/19/08 • Leave a comment! 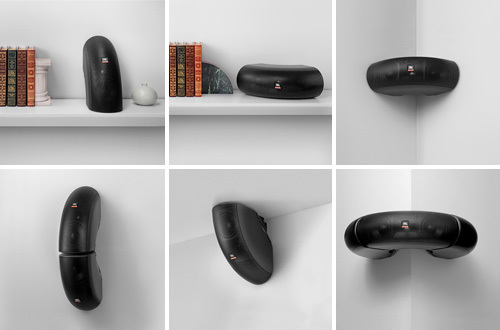 JBL refers to this speaker design as “90 degrees of pure ingenuity” and while I’ve personally never been stymied by a corner or a 90 degree angle when trying to install speakers, they do appear to make the task somewhat easier. I think the real innovation with these speakers (if you can call it that) is the modular design which allows you to easily connect up to 4 of them together, reducing the number of mounting brackets you need to attach them to a wall or other structure. Now I can’t vouch for how how good they actually sound, but with a price tag of $225 each from Harman Audio, I’m pretty sure you’re not just paying for the angled design.